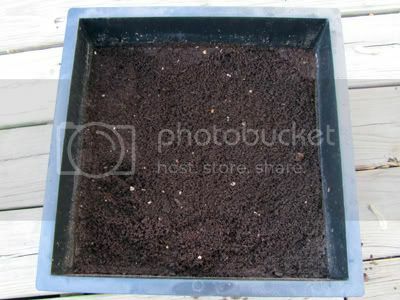 Benefit from Worm Castings by having your own Worm Compost Bin! As you may or may not know, I have a worm bin full of thousands of redworms that I keep in our dining room. The whole family enjoys feeding the worms our vegetable scraps and watching the babies hatch. My worm bin is the Worm Factory® 3-Tray Worm Composter. I have written before about setting up the worm bin here and here. I have written about how to harvest the worm compost from the bin, but I have never really shown why vermicompost is so great. 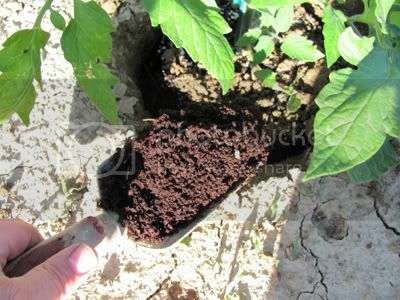 Worm castings, or vermi-compost is the super compost - the best organic natural fertilizer possible for your plants. I have always read this and believed it, but this year I decided to put it to the test. 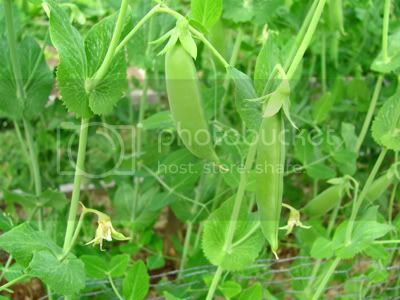 For my experiment I put freshly harvested worm compost as a top dressing on the two rows of peas on one fence and not on the other. The left side had the vermicompost added. 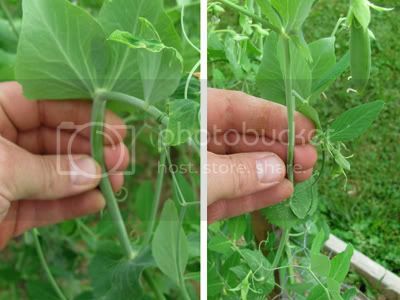 Look how much thicker the vine is than the one on the right. The right side did well too. I never would have known the power of the worms if I hadn't done this side-by-side test. The peas were fabulous, by the way. On the same day I added the worm castings to the peas, I transplanted my last early tomato plant. I added a generous amount of the worm compost to it's hole as well. It may be just a coincidence, but that is the plant that has been giving us our early ripe tomatoes so far! The other early tomato plants haven't ripened yet. Sounds fishy doesn't it? Or should I say wormy! I'm convinced that the vermi-compost made the difference. It makes me want to get another tray started on my Worm factory right away. Each finished tray makes quite a bit of compost. I have a friend that has been asking me about worm composting and how to do it. That has made me realize that I never really written a comprehensive how-to compost with worms post. I am now in the process of doing that, but for now all I can do for my friend is recommend some books like Worms Eat My Garbage: How to Set Up and Maintain a Worm Composting System and The Worm Book . Also, my Worm Factory® Composting System came with a great little informational booklet that I am loaning to her. She has said that she plans to buy the same bin that I have, so I know she'll be happy with it.One thing is sure, Vermicompost IS nature's super-compost! I have had to transplant my tomatoes and other plants to the garden a few at a time this year because I never seem to get more than an hour or so before it rains again! This year's weather has certainly been unique. Yesterday I planted some Luffa plants, Jack Be Little Pumpkins, more cucumbers and some more tomato plants. 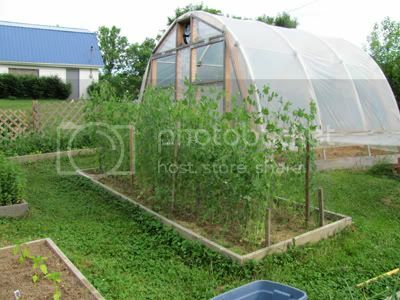 Our garden is 100% organic so we don't use any chemical fertilizers. 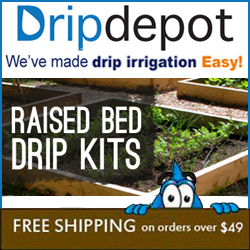 The beds got a healthy dose of compost added to them in February, but to be sure my young plants get a boost of nourishment, I am also adding some worm castings to the planting holes. Actually, these worm castings were mixed with some coir to sort of dilute them. 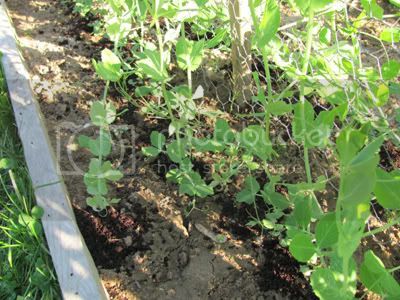 Worm compost, also called vermi-compost, is very potent by itself. 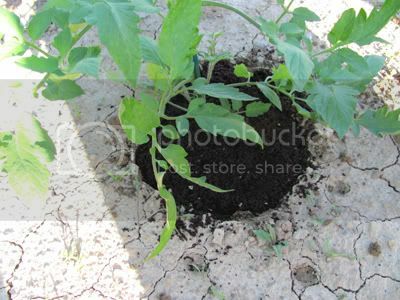 Adding vermi-compost to the planting hole helps coax the new plant's roots to venture out into the surrounding soil, getting the plant well established. I love having a ready supply of worm compost that I get from my Worm Composting System. If you haven't seen my worm bin before, you can see all my worm posts by clicking here. My favorite post is when I showed pictures of the worm babies. 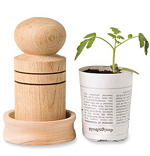 Worm composting is fun and can be done right in your kitchen. I may have to harvest some more vermi-compost to finish transplanting. If only we would get a couple days in a row without rain! 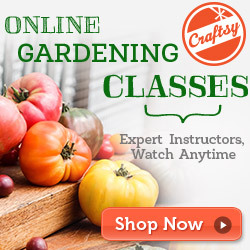 Oh well, such is gardening I suppose.